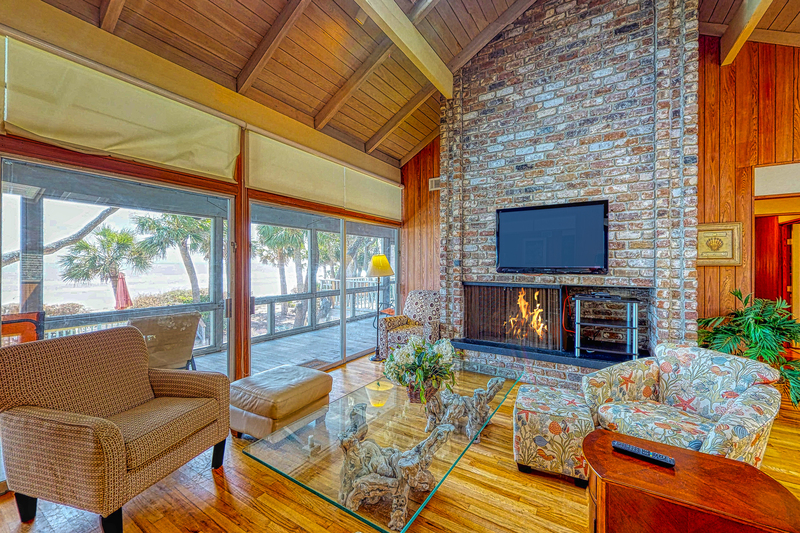 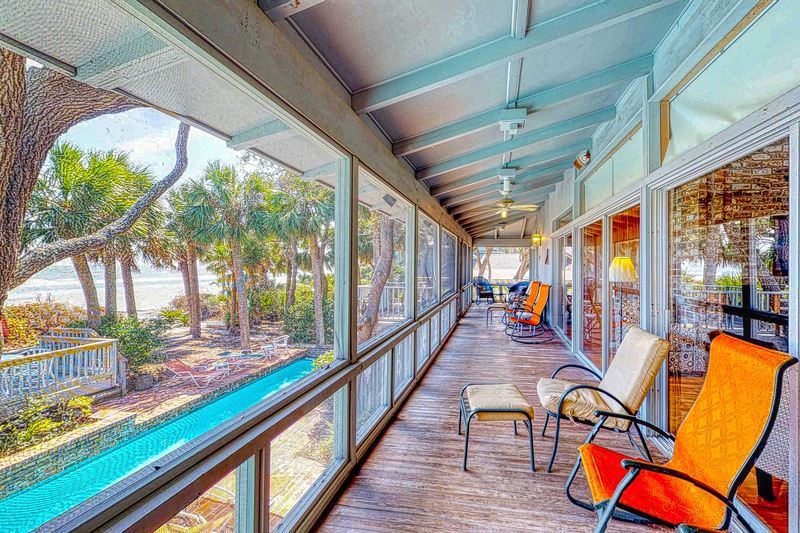 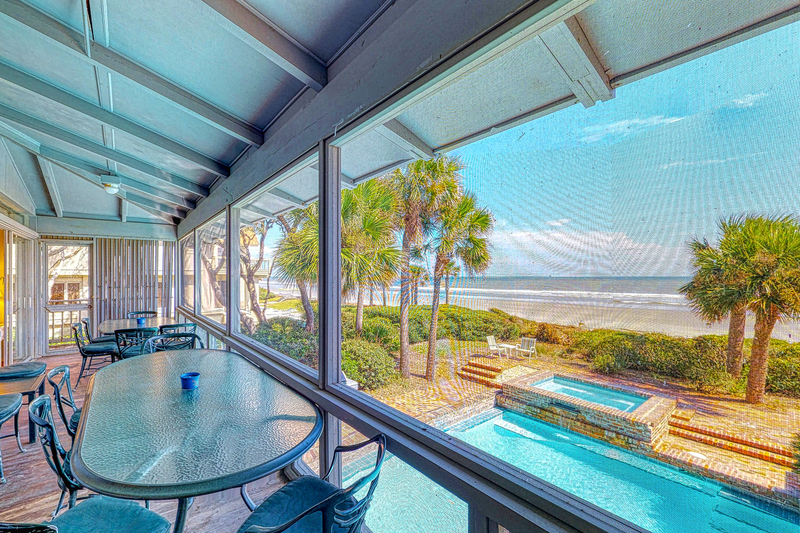 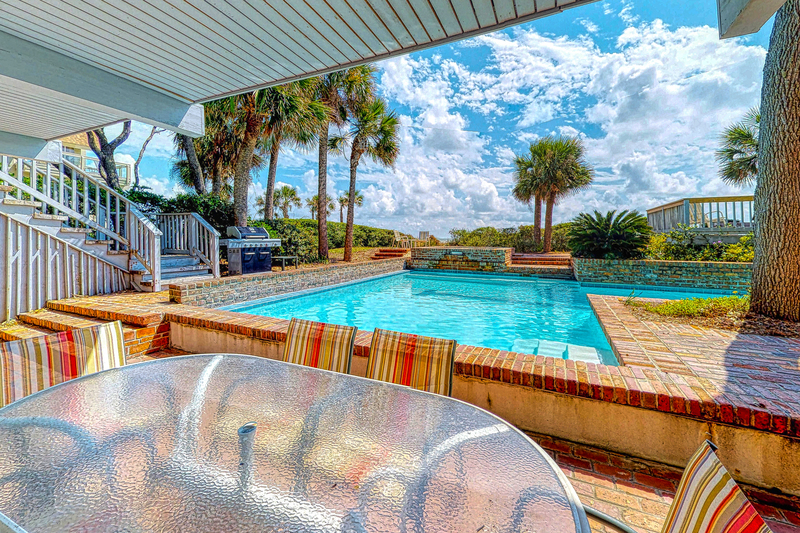 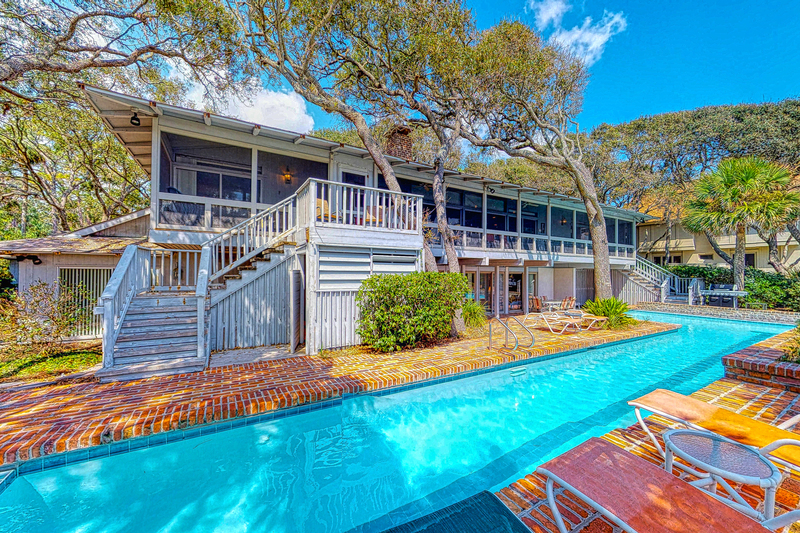 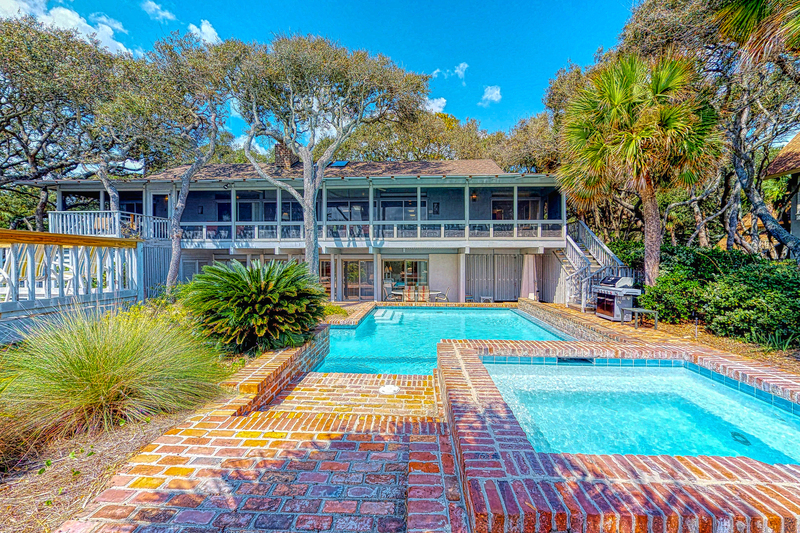 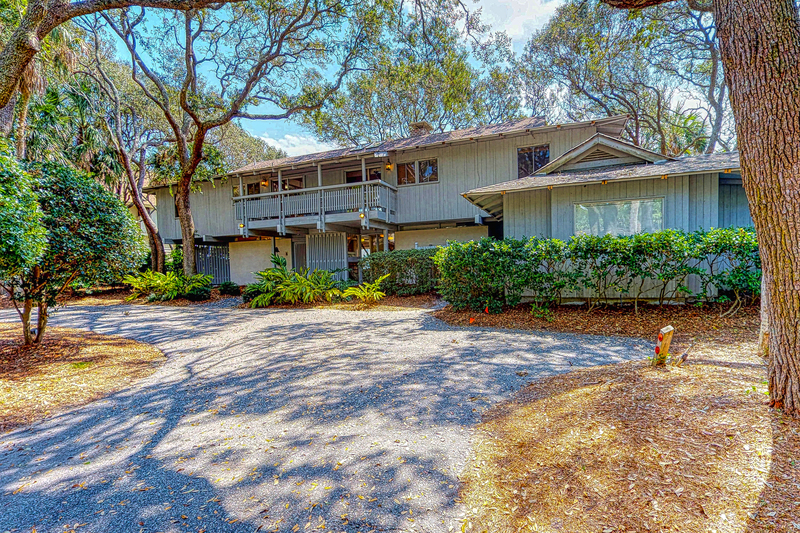 Ultimate Beach House for a multi-family vacation, with screened porch spanning the length of the house, overlooking one of the largest private lap pools available and incredible views of the beach and ocean. 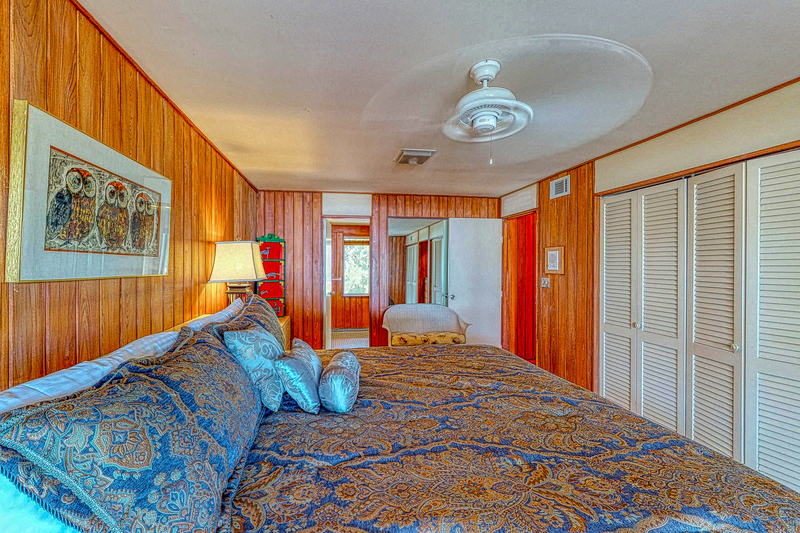 There are four master suites, two with Jacuzzi tubs. 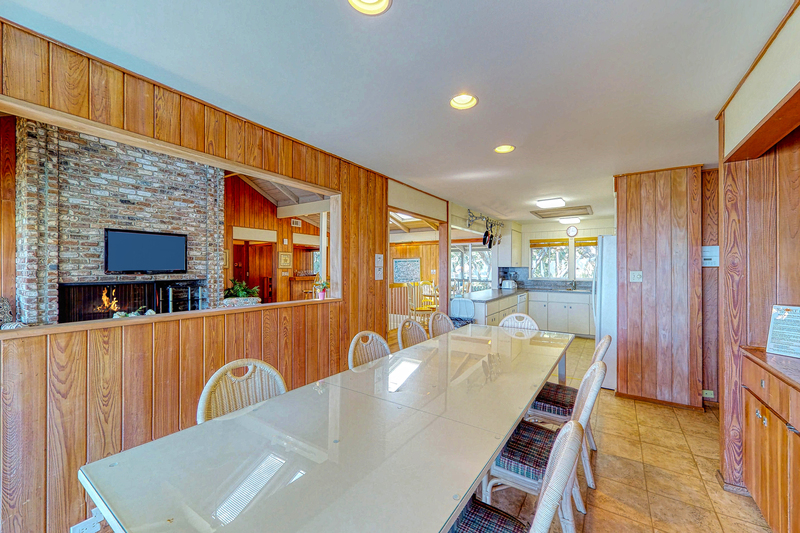 Great for family gatherings or groups. 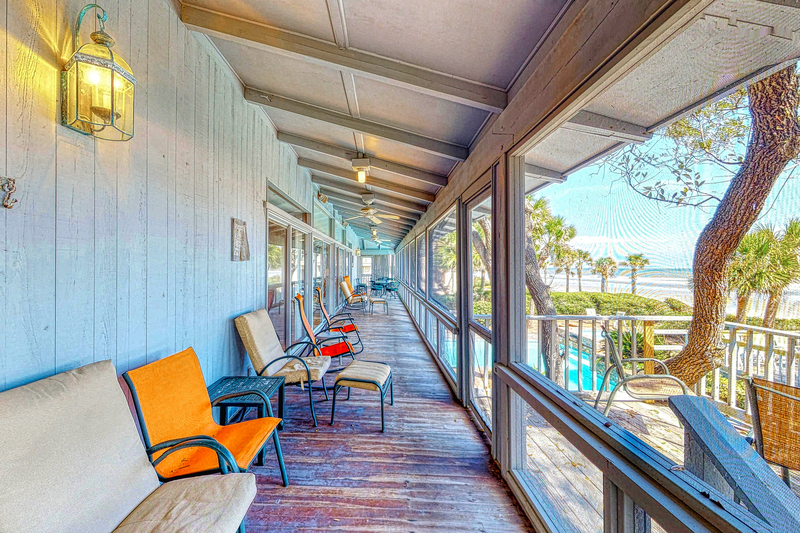 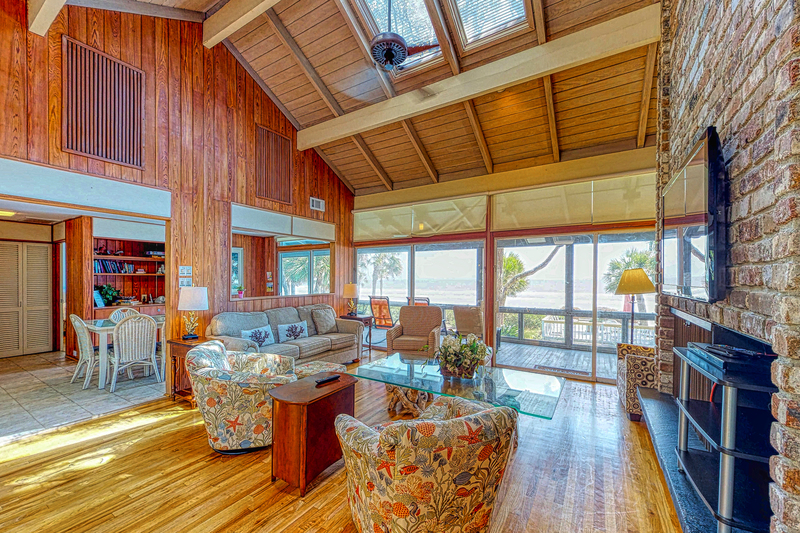 As one enters into the foyer and through to the first floor oceanfront den. 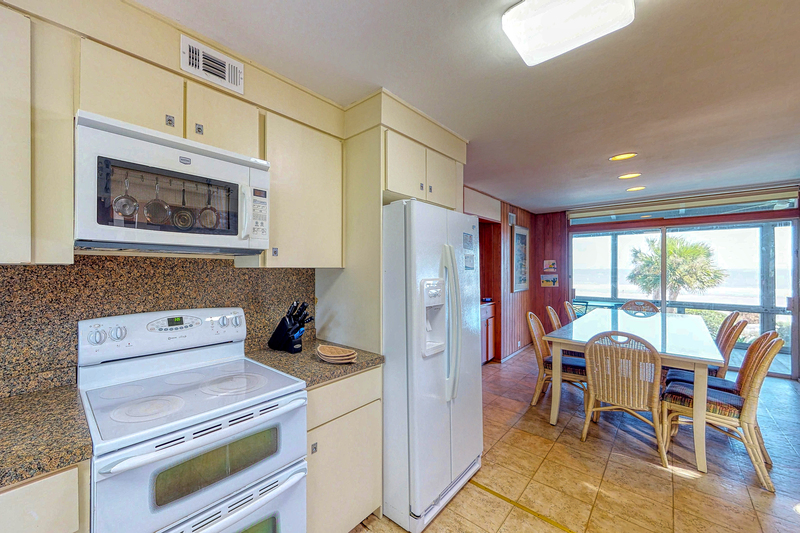 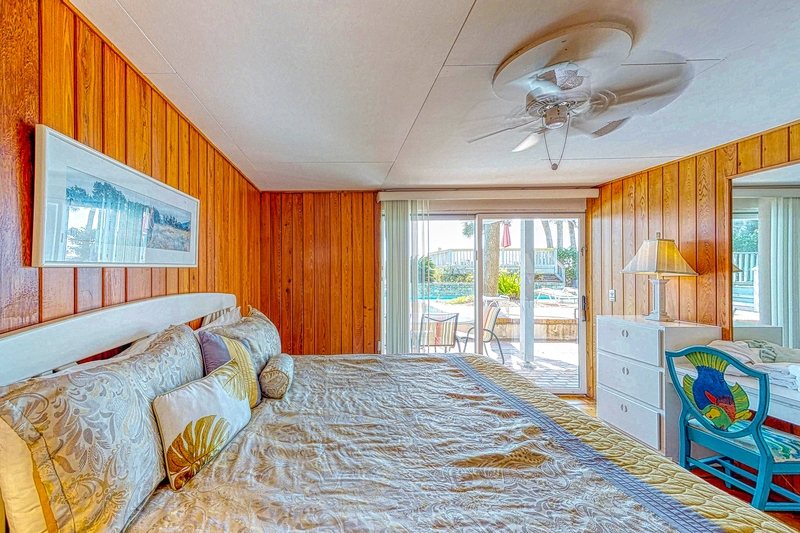 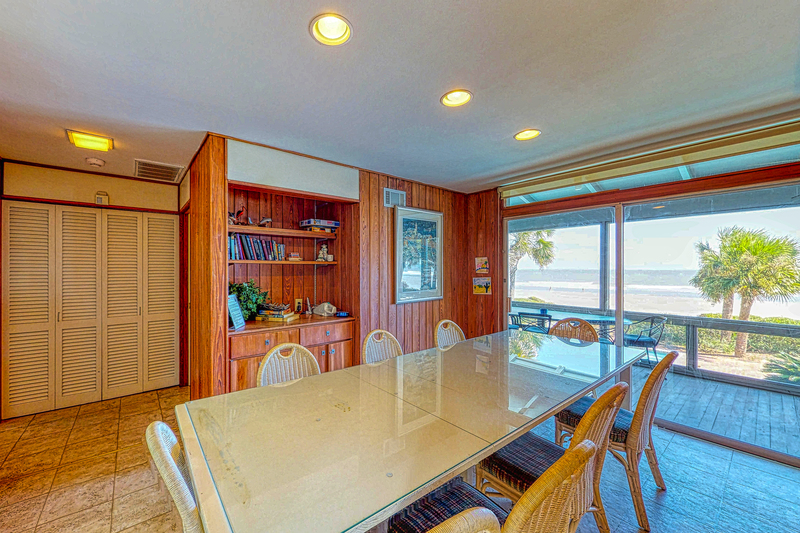 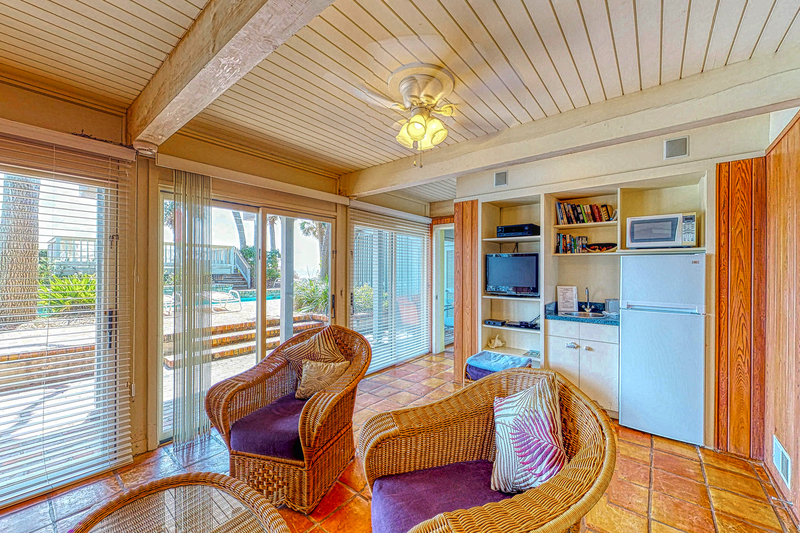 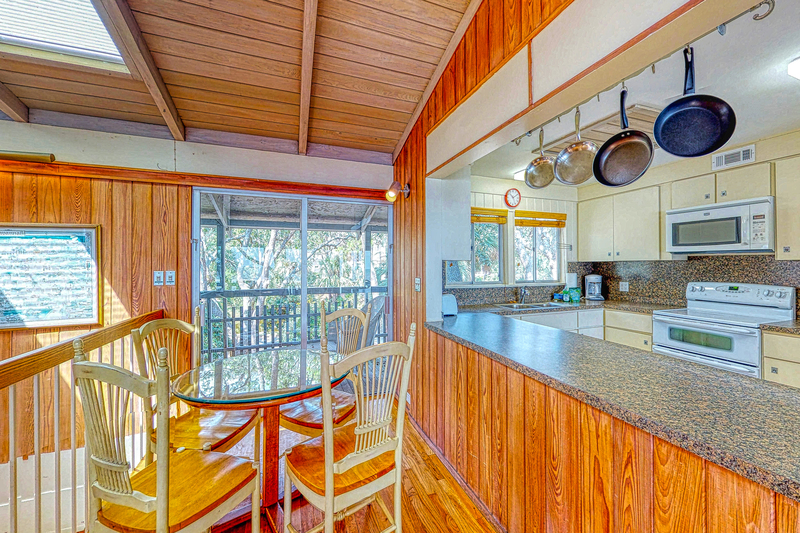 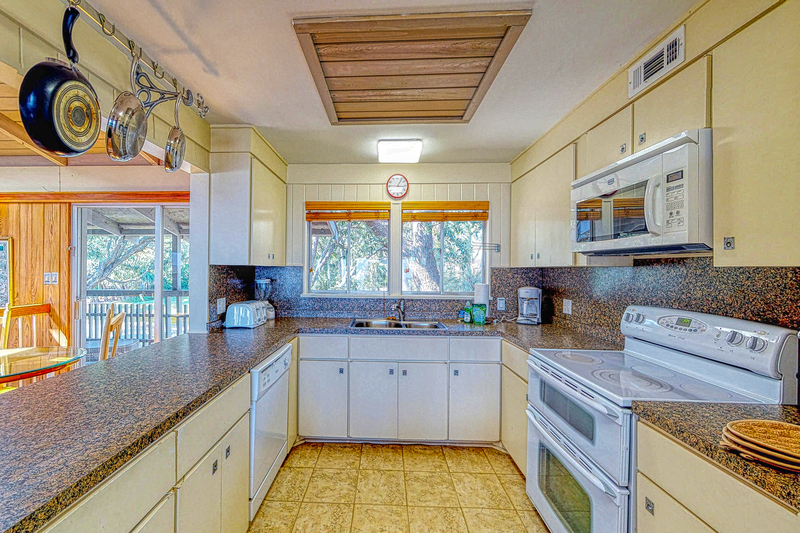 There is a queen sleeper, wet bar, refrigerator, TV, DVD, chairs and great view of pool, decks and ocean. 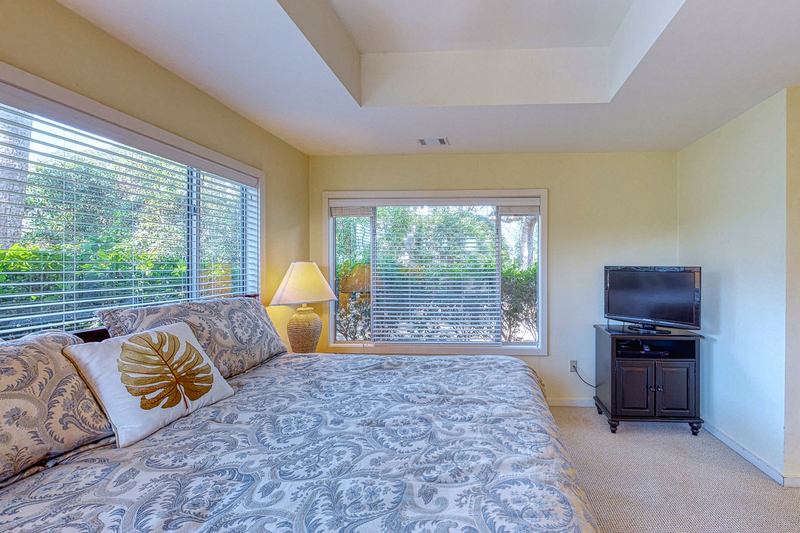 To the left of the den is a bedroom with king size bed, private bath with shower and access to pool and beachthrough patio door. 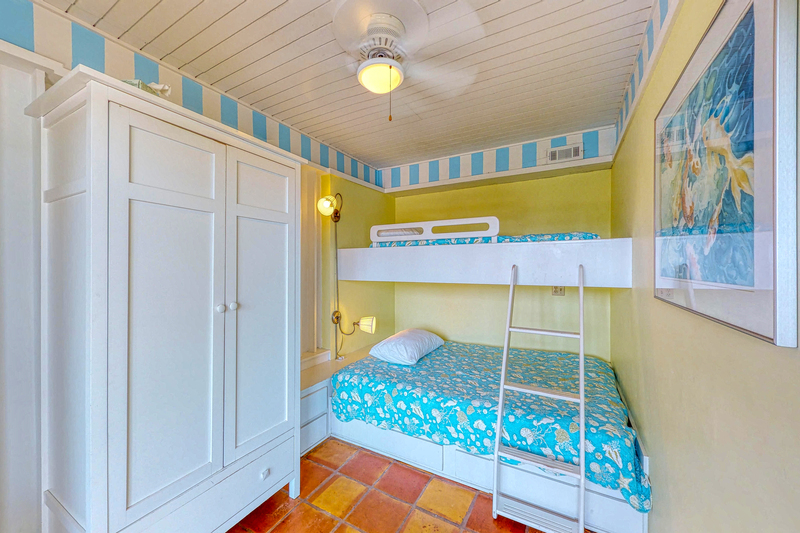 To the right of den is the bunk room with a double bunk on bottom and single bunk on top. 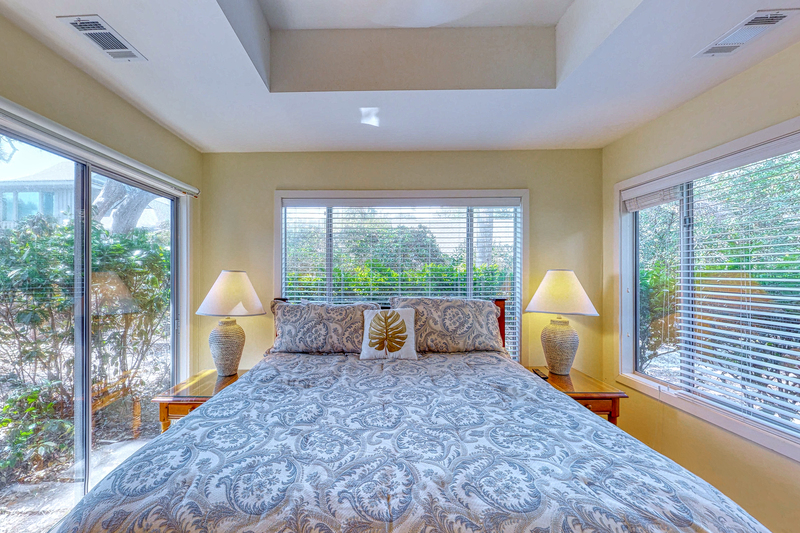 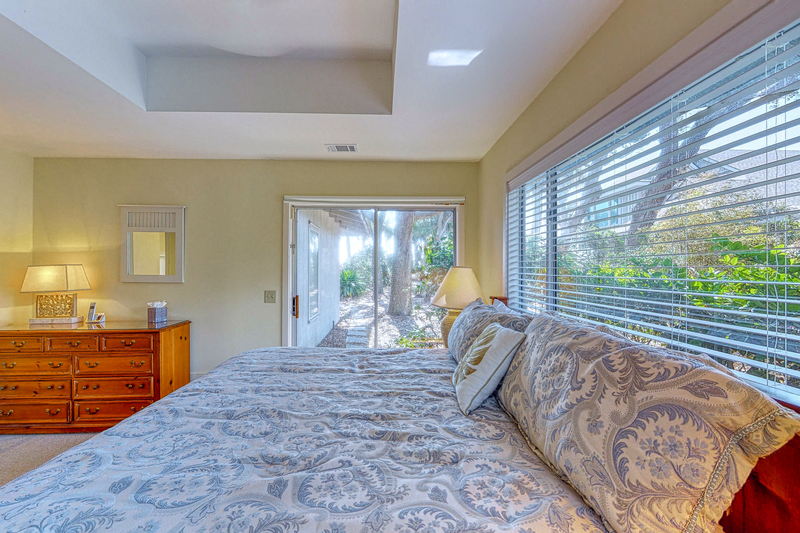 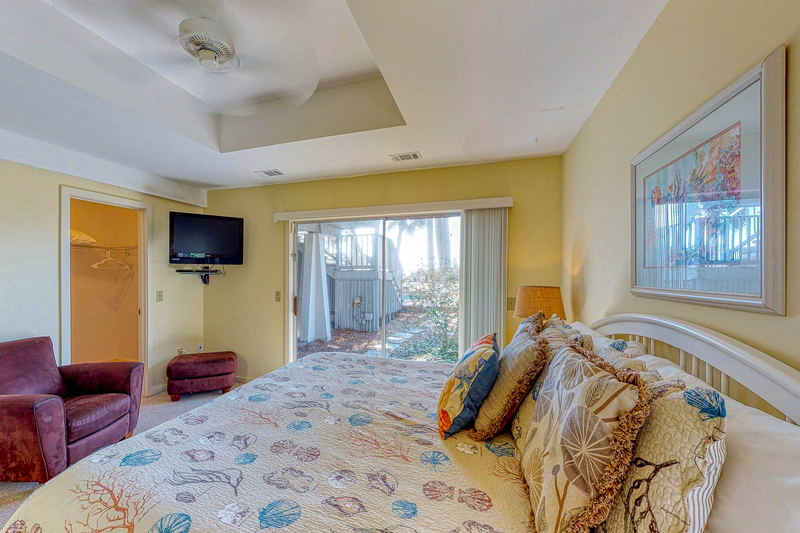 There also is a private bath with shower and access to pool and ocean through patio door. 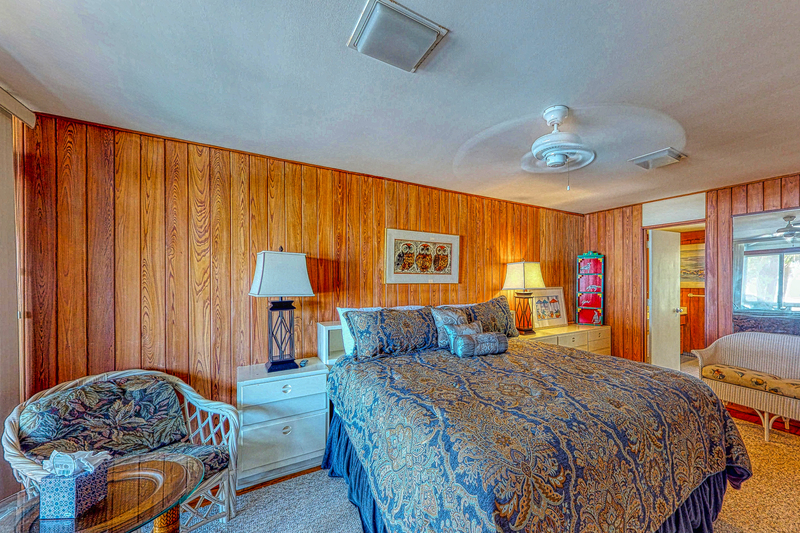 Back to the foyer and down the long hall which includes the washer and dryer section, you enter another bedroom with king size bed with 32" flat screen TV and DVD. 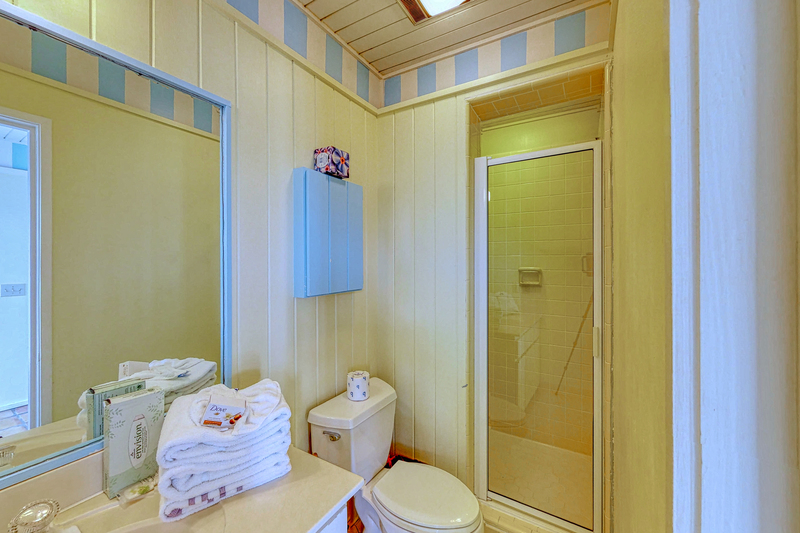 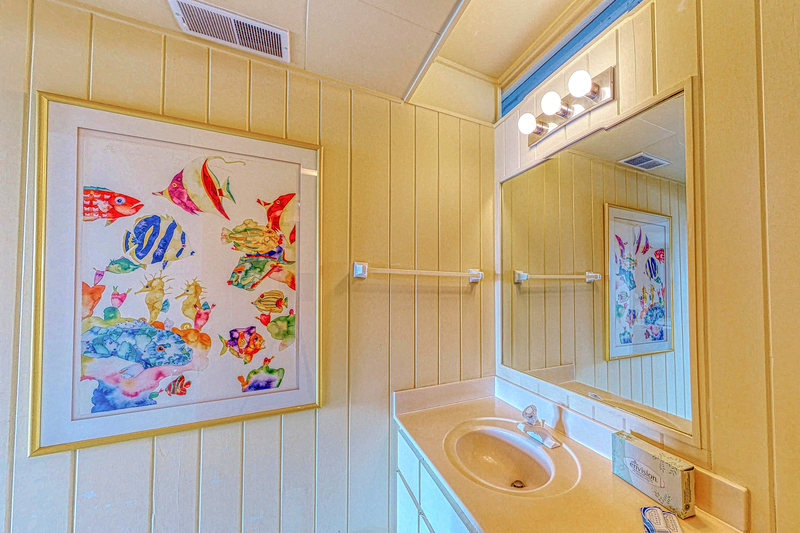 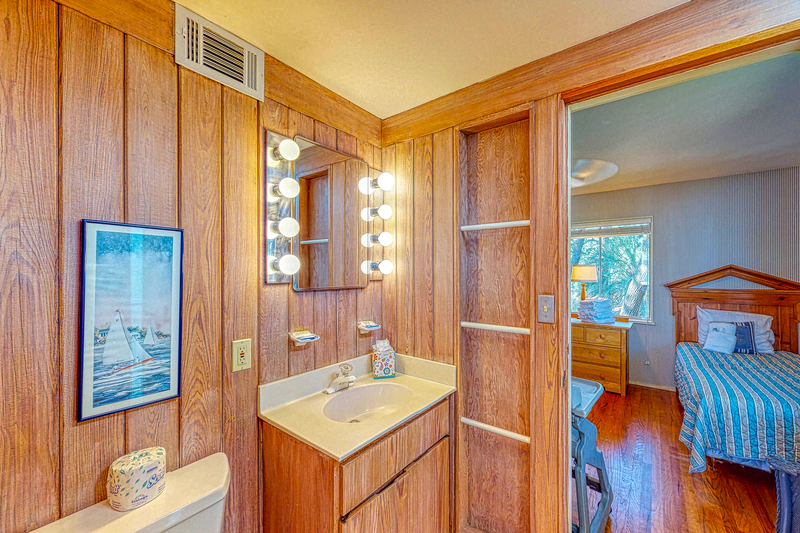 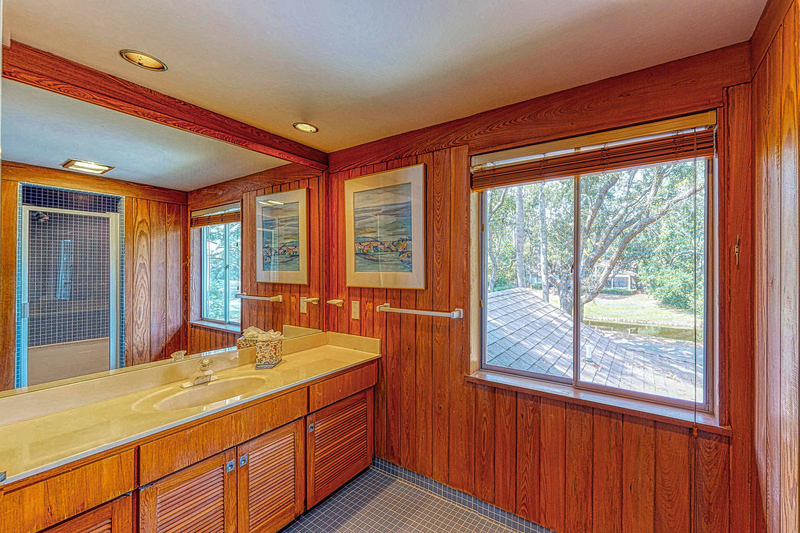 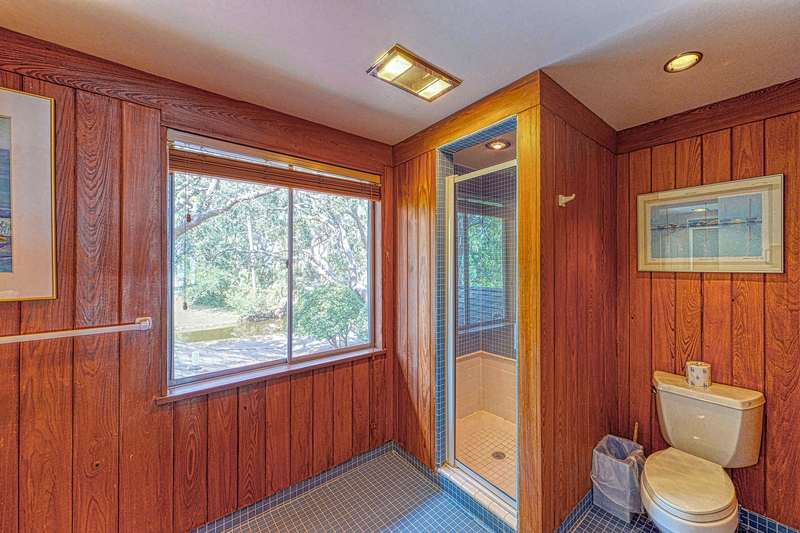 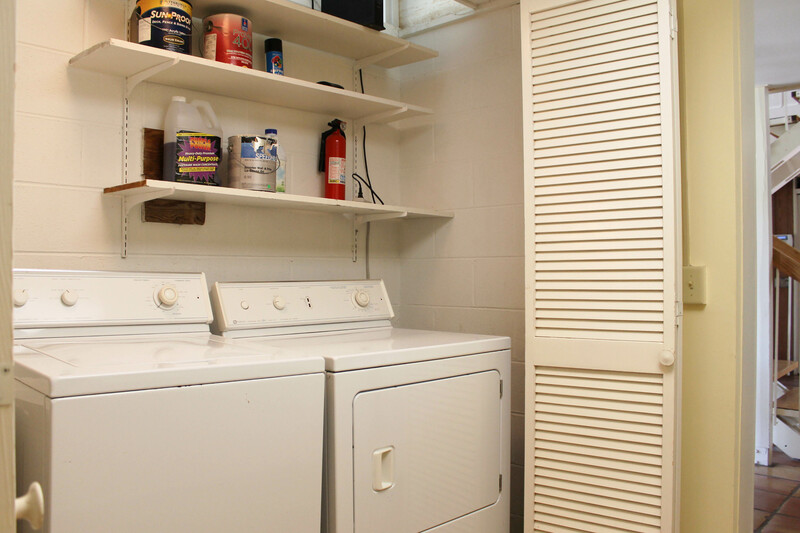 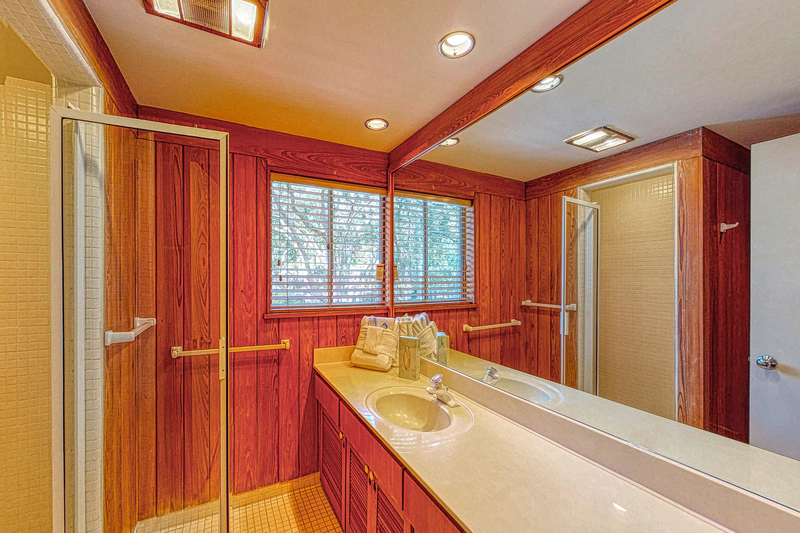 The private bathroom includes a Jacuzzi tub, shower and water closet. 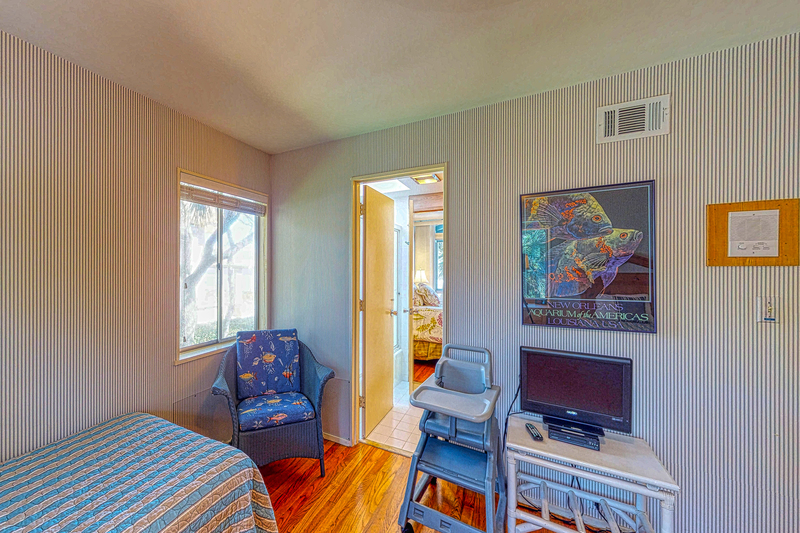 There is outside access from this room. 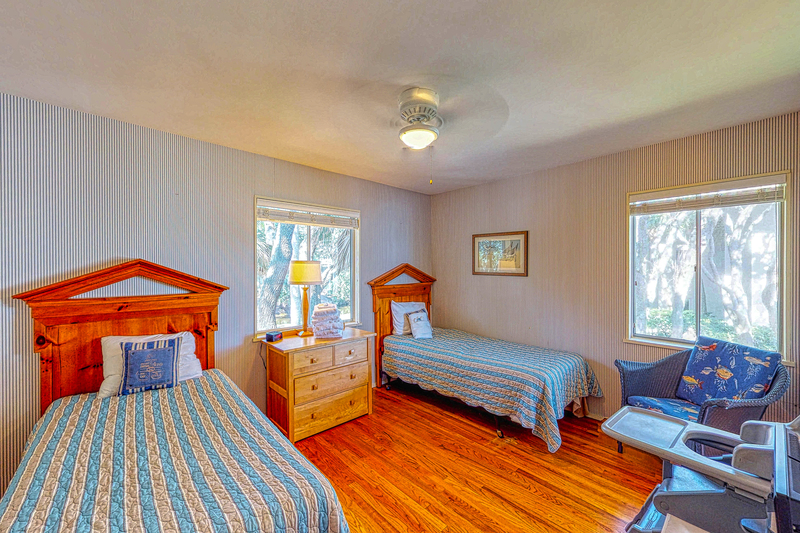 Continue to the right at the end of the hall, there is another bedroom with king size bed, 32" flat screen TV, DVD and access to the outside. 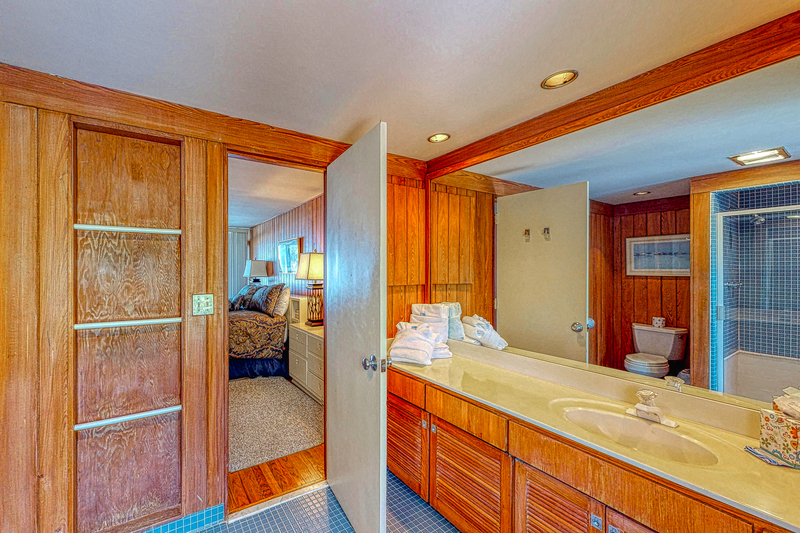 The private bath has a double vanity, Jacuzzi and shower. 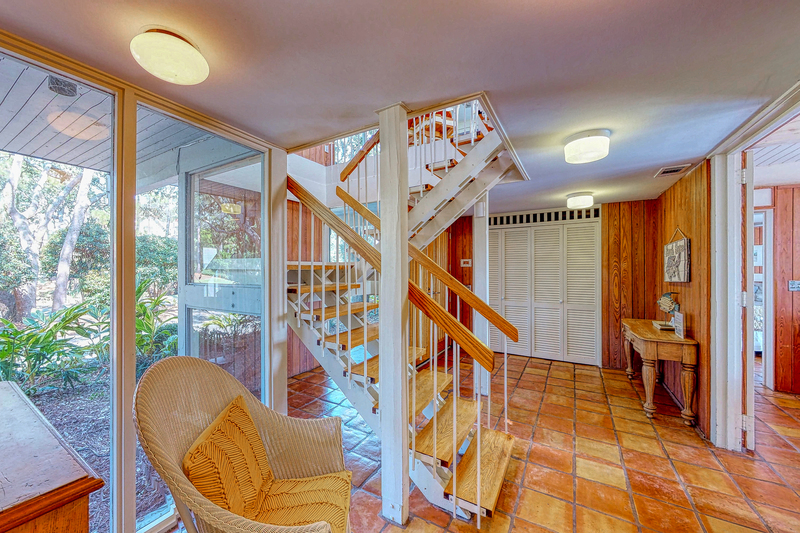 Returning to the foyer, the stairs will lead you to the second floor and into a large open family room, kitchen, dining room for 10 and breakfast area for 4 and wet bar with bar stools. 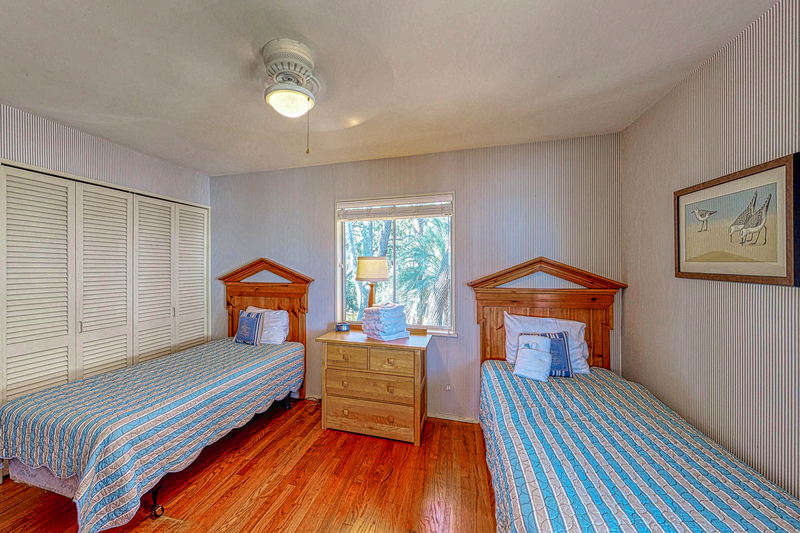 To the left of this area is a twin room and a king bedroom. 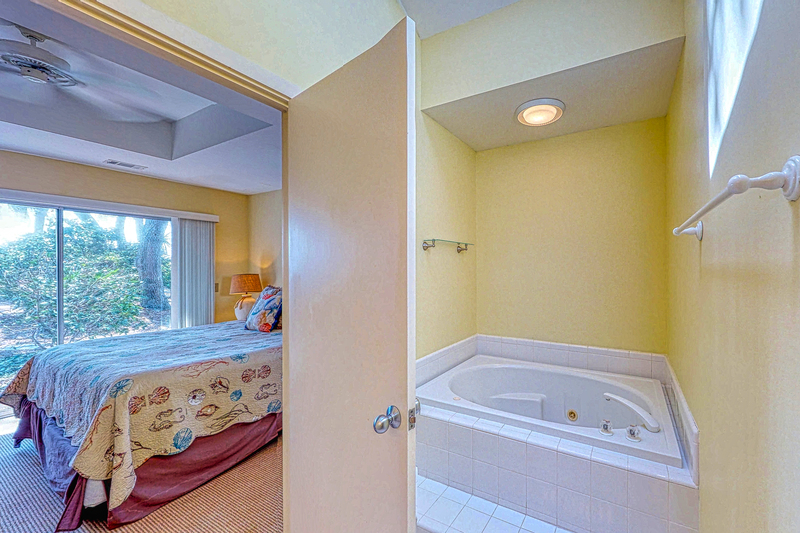 These two rooms share a bath with tub/shower combo. 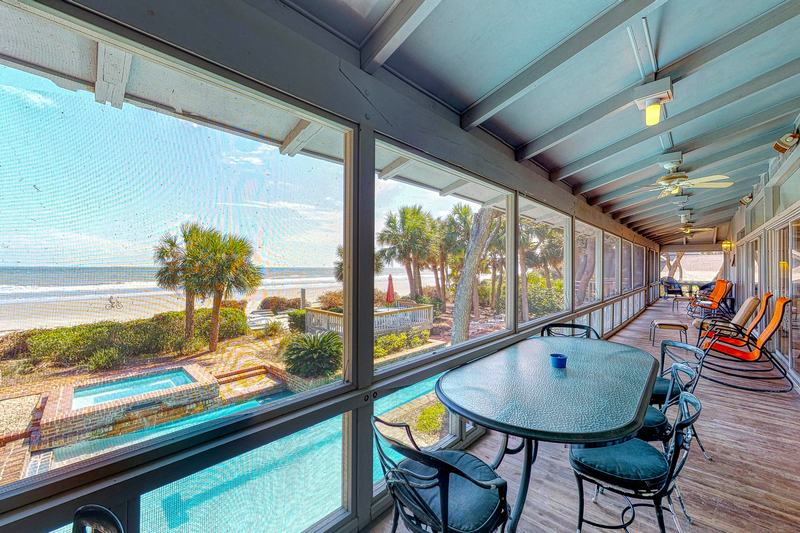 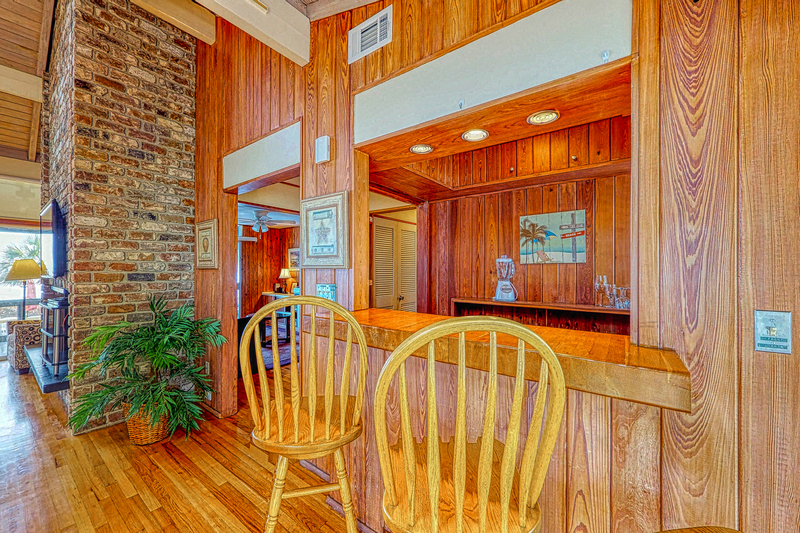 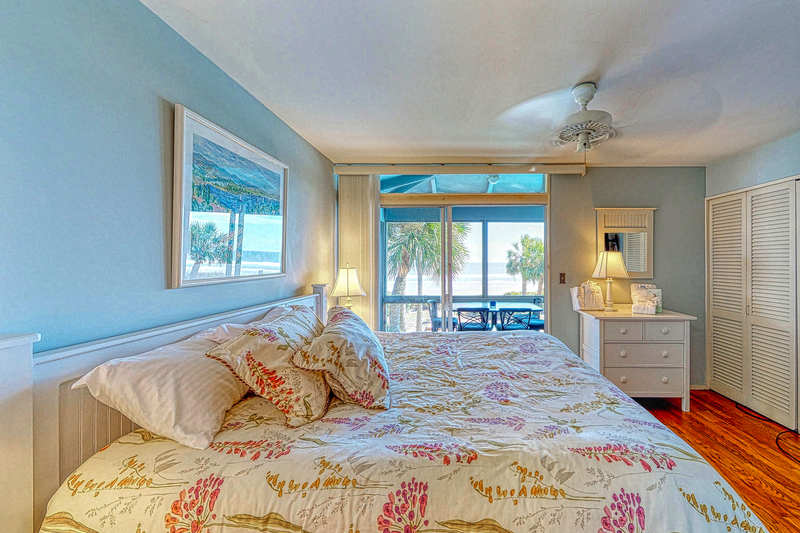 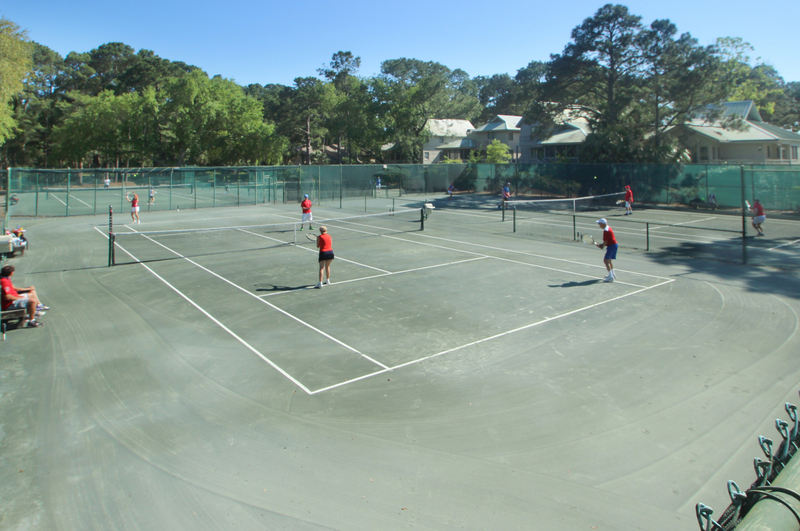 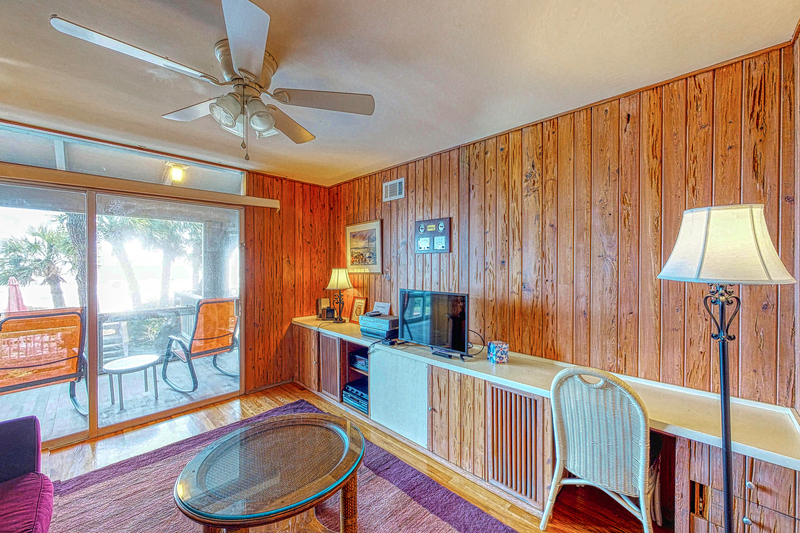 There is a 19" flat screen TV and DVD player in the king room and access to the screened porch. 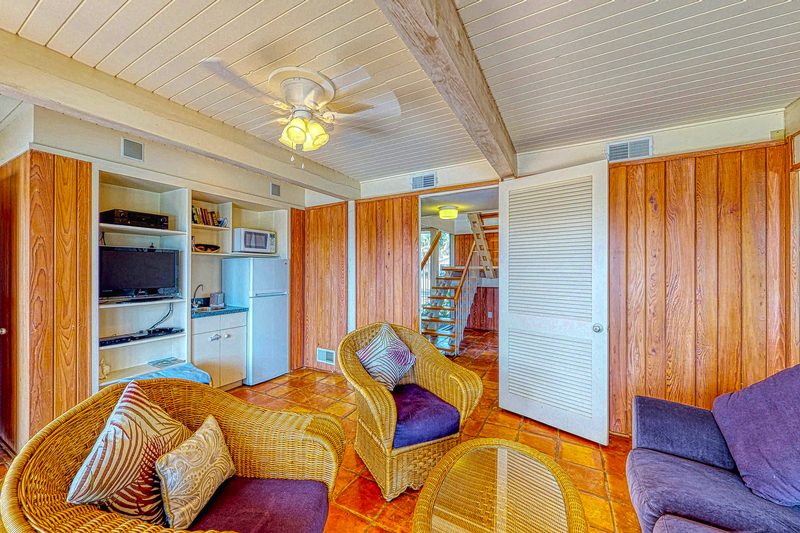 To the right of the living area is another den with sleeper, DVD, TV and a bathroom across the hall, with shower. 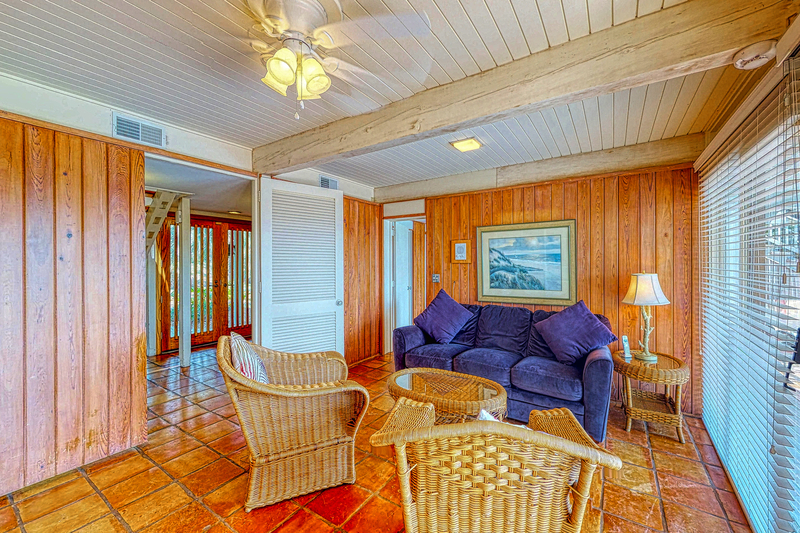 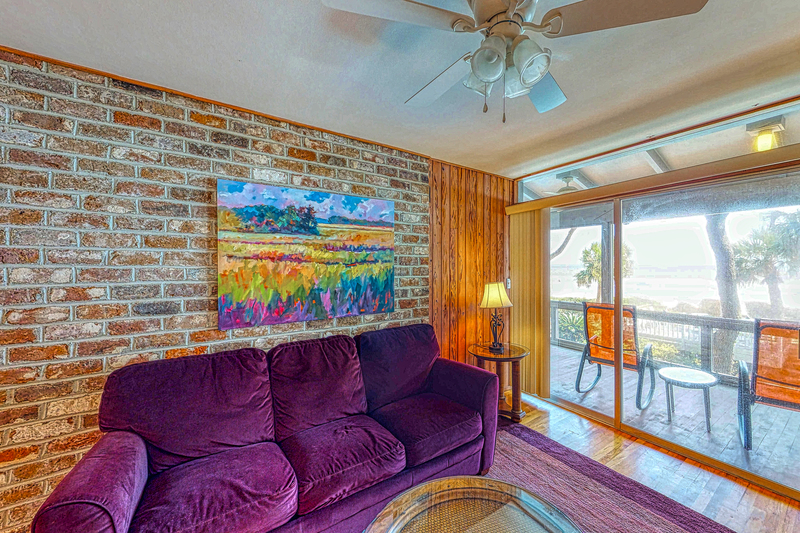 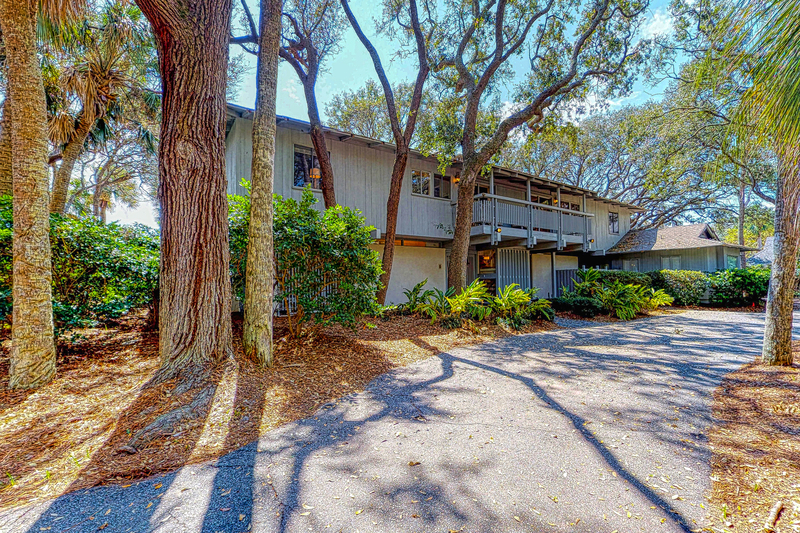 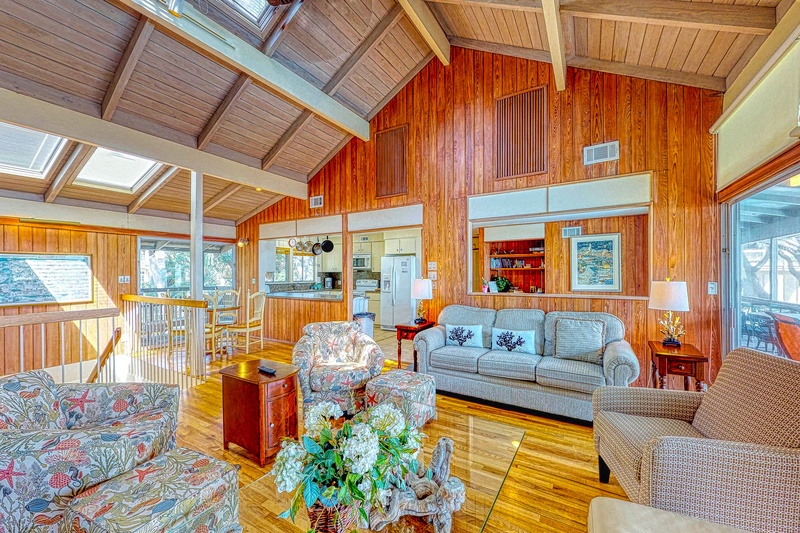 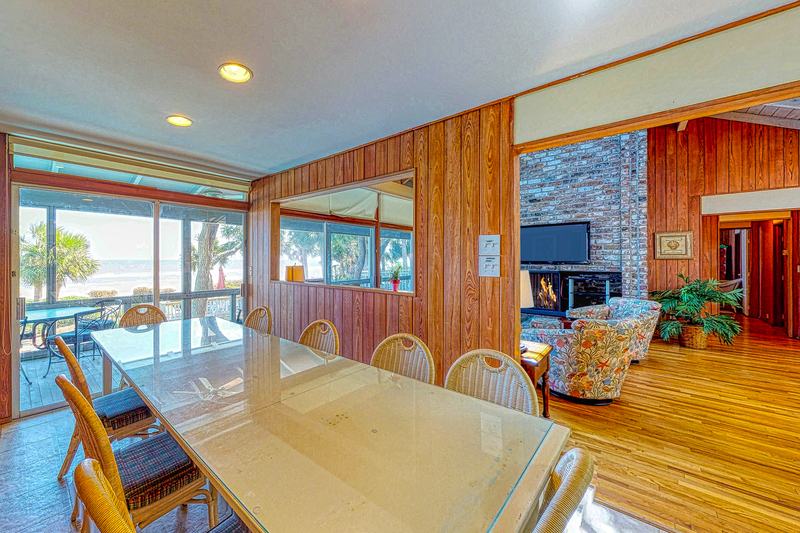 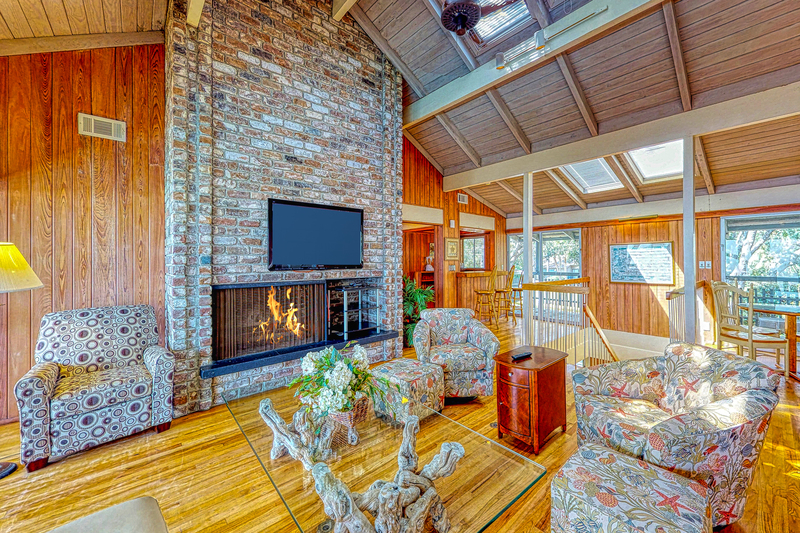 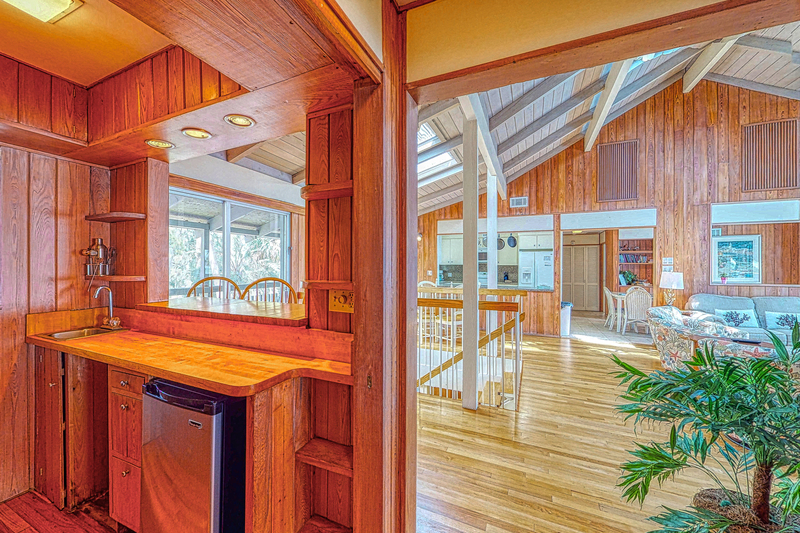 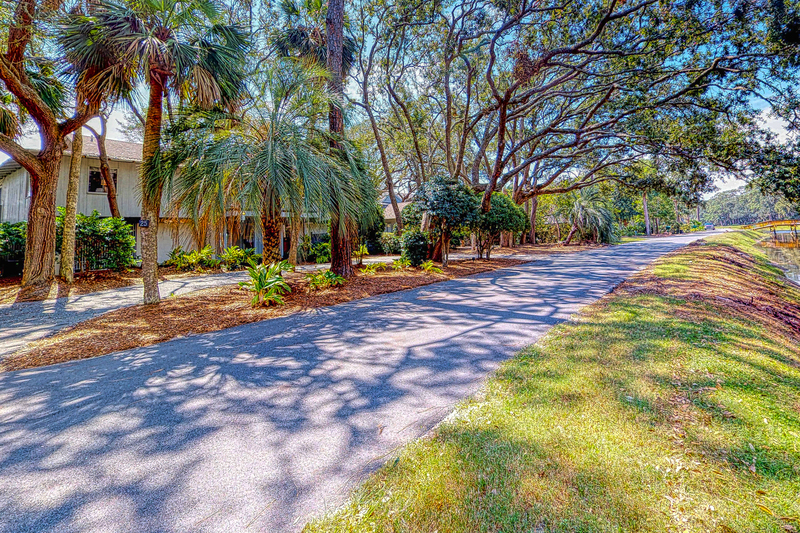 At the end of the hall and beyond the den is the upstairs master king with TV, access to the screened porch. 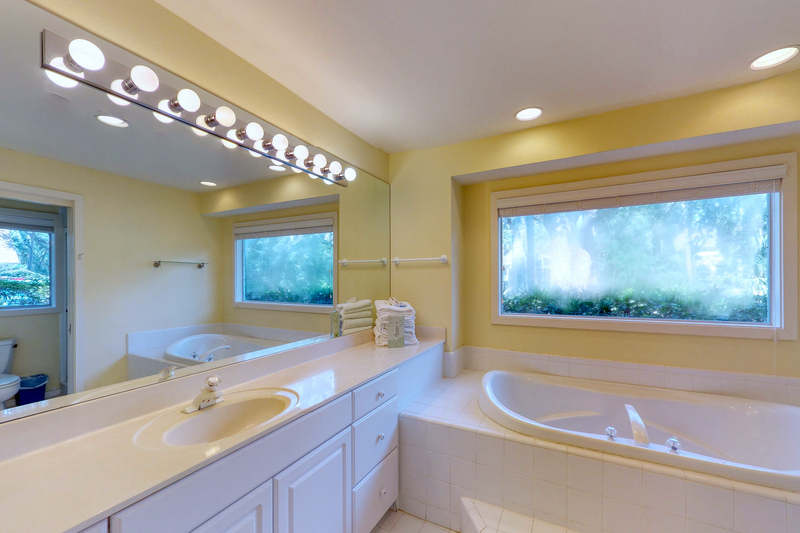 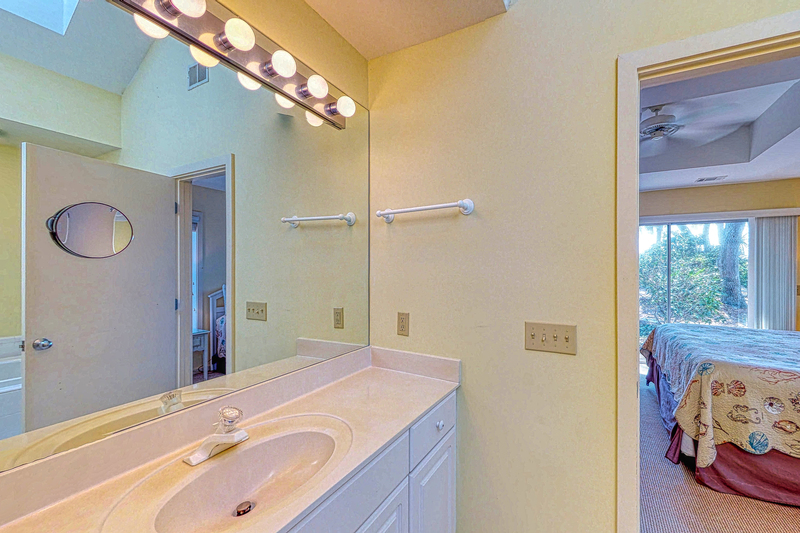 The private bath has a double vanity and shower. 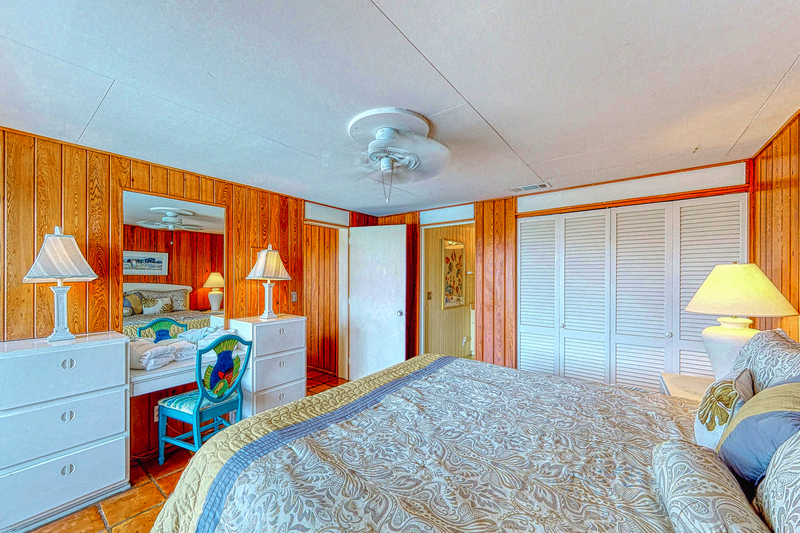 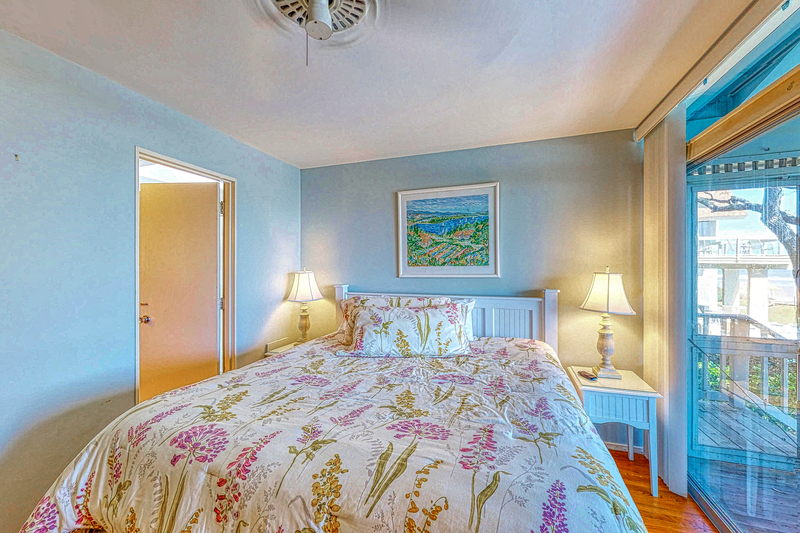 All rooms are oceanfront except one downstairs king and the upstairs twin bedroom and have access to the outside porch, patio, sundecks, pool and ocean. 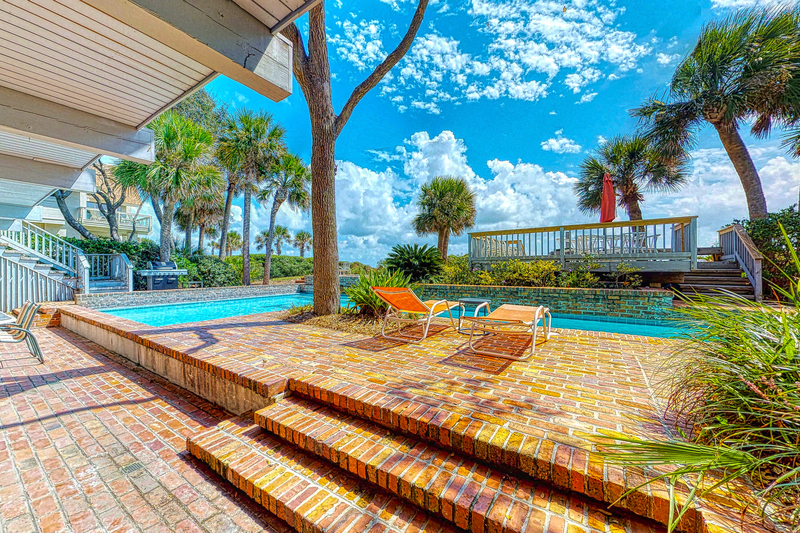 What scenic views from this house! 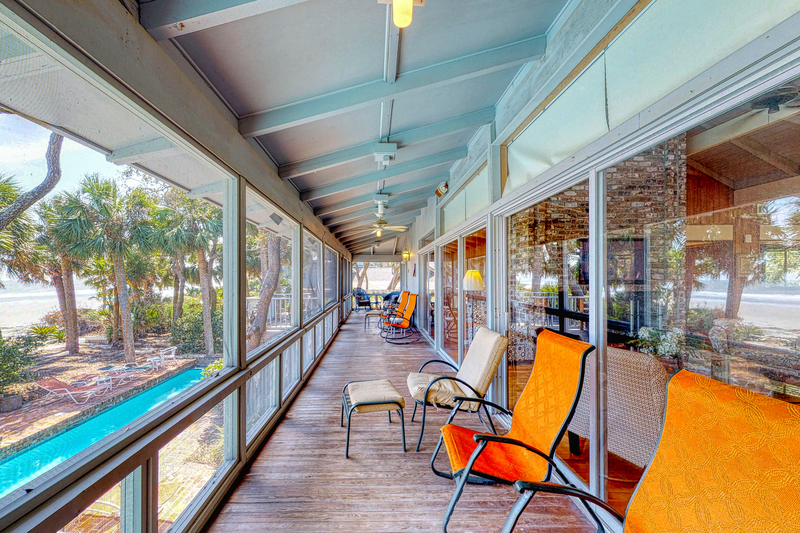 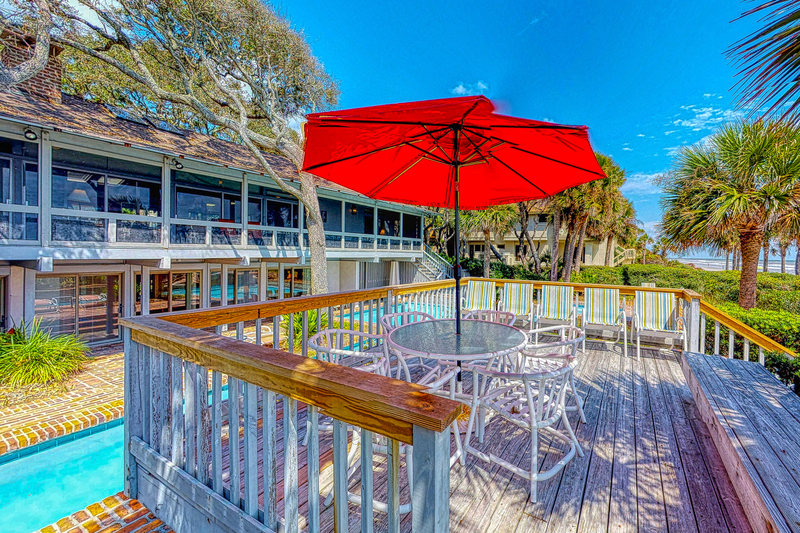 The decks and patio are equipped with furnishing for sunbathing, viewing a breakfast sunrise, or just lounging in the shade under the overhang. 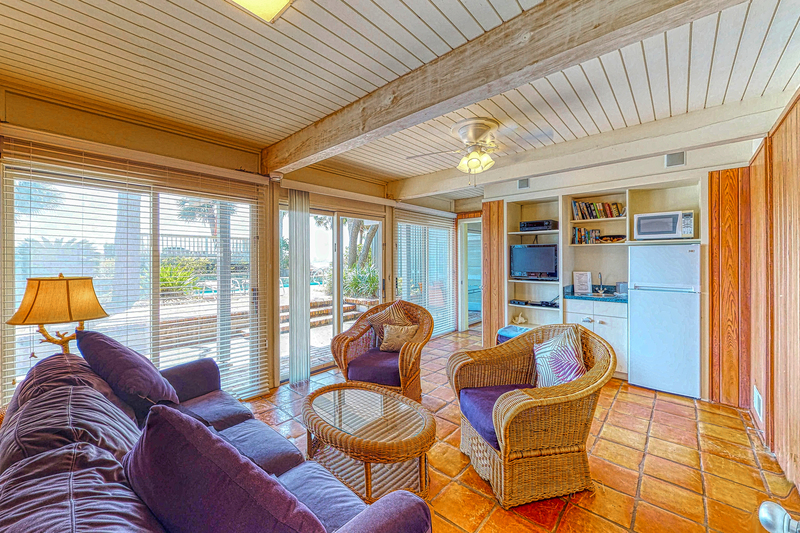 There are three areas for sunbathing; around the pool, separate sun deck and at the boardwalk to beach. 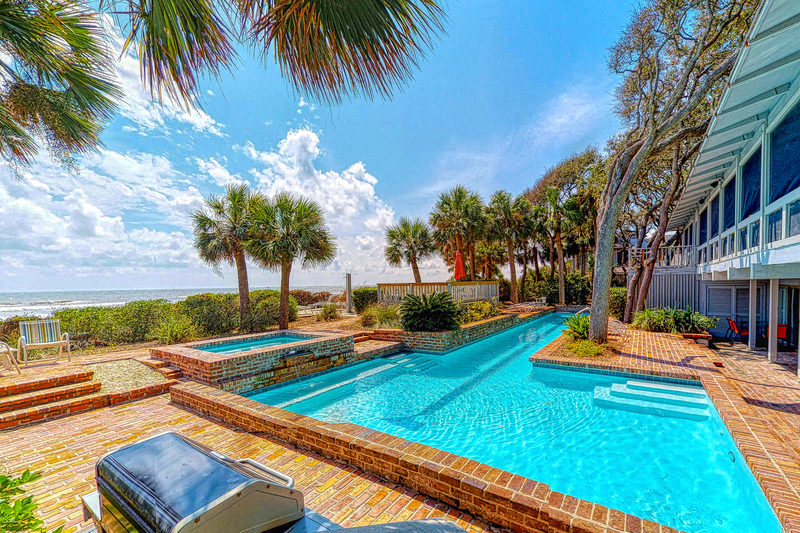 The pool is ideal for lap swimmers and frolicking with the children. 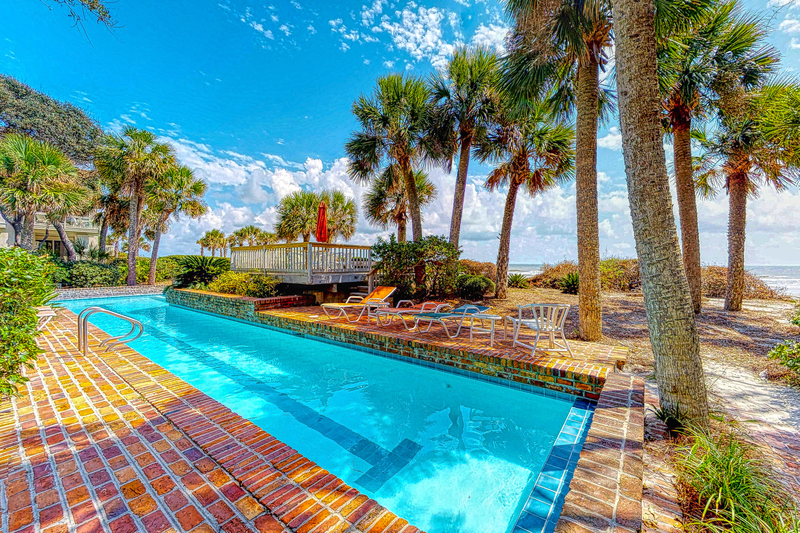 The waterfall spa and pool can be heated for an additional fee.